Iowa tourism is a growing business. According to 2016 research released by the Iowa Economic Development Authority, state tourism revenues exceeded $8 billion, with communities and businesses across the state trying to carve out a piece of the pie for themselves. Iowa State University Extension and Outreach is ready to help. Tourism specialist Diane Van Wyngarden serves all 99 Iowa counties. “My niche is working with small businesses,” she said. “I work very closely with businesses wanting to capture more of the tourism market. My clients include Agritourism businesses, restaurants, lodging, and community attractions. 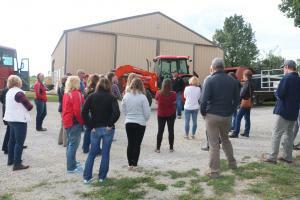 Van Wyngarden says her tourism focus with businesses located in rural Iowa is group travel, because that program benefits Iowa businesses in two distinct ways. “Secondly, I come to your business or attraction and provide onsite group travel consultation. This customized onsite group travel consultation is not available in Iowa from any other source.” Van Wyngarden said she frequently works with businesses who are not normally included on tours or trails but want to initiate or expand their business plan to include group travel services. “It provides another product for business profitability,” she said. Van Wyngarden has provided group travel consultation and recommendations to 311 businesses across Iowa, and is available for consultation with additional businesses or organizations interested in initiating, improving or expanding services for group travelers. “I provide a tool kit of practical techniques for group travel success,” said Van Wyngarden. “I enjoy working with both communities and individual businesses, and I love watching them succeed.” Van Wyngarden has many success stories, and shares examples of her work in both rural and urban Iowa settings. John Maxwell farms near Donahue, IA and is Vice Chair of the Scott County Extension Council. Van Wyngarden first met with Maxwell on his farm in 2008, when he expressed interest in opening his farm for group visitors and utilizing group travel as another sector of farm profitability. “We discussed group logistics, accessibility, farm-to-table menus and price points,” recalls Van Wyngarden. The Maxwells now host over 6,000 visitors per year on their family farm. “John and Joan Maxwell have a targeted tourism focus of educating groups about Iowa agriculture, and they do that exceptionally well, said Van Wyngarden. Robert Vavra and Van Wyngarden have been working together for several years in providing unique educational experiences in the backwaters of the Mississippi, and Vavra shares these experiences with the public in Marquette, IA. Van Wyngarden credits Vavra’s success to his attention to the “Key Ingredients of Group Travel”, which she teaches during her business consultations, combined with Vavra’s wit and personal story. “Robert’s backwater experiences provide the authenticity which travelers seek,” she said. Information about Van Wyngarden’s group travel trainings and the business application form are available at www.extension.iastate.edu/communities/tourism-workshops-and-business-trainings. The group travel consultation fee is $50 for a two-hour consultation with Van Wyngarden at any Iowa location. For more information, contact Van Wyngarden at dvw@iastate.edu. Experience Iowa’s Best Travel Yourself! www.IowaRoadScholar.com for “The Best of the Upper Mississippi River”.